*Disclaimer This isn't really a review since I didn't actually read the book in its entirety. However, I still wanted to rage my feelings about the end of The Southern Vampire Mysteries series by Charlaine Harris. This will be spoiler free but if your a fan I'm sure you can guess why I'm left raging. Anywho onwards to my non review. I'm going to be completely honest, I didn't want to spend money on this book since I had a feeling the series would end horribly. Instead I spent 20 minutes grazing through it at the store. The fan girl in me just needed to have some sort of confirmation of how it ended. If I could somehow get this gif to show Dead Ever After being thrown on the ground I would do it. Seriously though wtf Charlaine Harris. Please do the world a favor and never write another series, OK? Would it really have been awful ending the series as the fans wanted? Actually No, as the series demanded! Instead with little time to come to grip with the about face the characters take and it is quite sudden the series ends in the most soul crushing way ever. I don't doubt readers everywhere are raging in anger. Unless of course you like the pairings then I guess this will make you extremely happy. After the last book when things started to go downhill I hadn't yet decided whether the Author was angry at the fans for liking the show better or if it was simple boredom with her characters. I'm convinced now it's a mixture of both. Needless to say this fan ( and I'm using that term lightly atm) was soo not impressed. Still not quite understanding the anger? Let's put it this way then, out of pure unadulterated rage I almost feel like setting my entire series on fire. Sure I've already spent the money but at least I'll have some satisfaction. Which is more than I can say about the conclusion to this series. 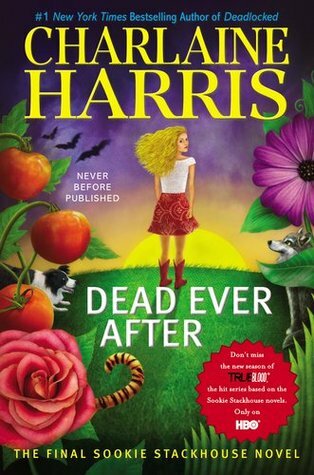 You don't have to take my word for it though (sad face) but in case you do, I highly recommend you borrow Dead Ever After or better yet skip it entirely. I think it is best we all pretend the series ended at #10 maybe even #11 and we just go about not acknowledging the utter fails of #12 & #13. May they forever sit unread gathering dust on shelves locked in a warehouse somewhere. Now I know some of you won't be able to help yourself and will still take the time to read Dead Ever After. It's OK I forgive you. So here's a final piece of advice, Make sure to remove all breakable items from within arms reach. You will have a strong desire to throw them. Reader be warned!! Lol yeah I really am happy the show stays true to the core but mixing things up. It isn't 100% faithful. Honestly, I predicted how this would end while reading book 1. I always thought all the suitors were red herrings. Sookie was such a huge sun worshipper and talked so often about not being a vampire I couldn't see any other ending coming out of this. At the same time, I think using the big blond guy as a red herring was the worst thing she could do. It immediately created a massive demand for a certain ending to occur among a group of her fans. BTW, love the gif! LOL! I say that phrase often! I expected them together at some point but not as a hea pairing. I always thought that'd be reserved for the certain blond guy. But the last book you could tell it was shifting and I think it was too late to put them together. It didn't feel right by that point. Well, if you reflect on the books, from the very beginning Sookie was adamant about retaining her humanity, having kids, and growing old with her HEA. She was always point blank about that. Also, the author emphasized her sun-worshipping ways in EVERY book. I think she laid out Sookie's path very clearly. But toss the big popular blond guy into the mix and where do you think people are going to be looking? I think the assumption was that Sookie would give up the sun, her dreams of children and growing old, and become a vamp out of "love." Considering Sookie's stubbornness, I doubted this would go down. Honestly, I think the books of S/E being "married" and together were the author's way of throwing the fans of that pairing a bone, but never intended for that relationship to stick. I checked out of the series about four books back, honestly. I feel the first 8 books were the strongest but up to 11 I still got enjoyment out of them. I do agree about Sookie but as I was telling my husband I thought CH could've made her immortal without turning her. The last two books should of been the vamps locking her up so they could at regular intervals drain her (due to her bloods unique properties). They would then mix her blood with true blood and sell it at a premium as it would afford the vamp who drank it several hours of sunlight immunity. She's eventually rescued and they figure out how to make a synthetic version for which she holds the patent. She then lives eternally ever after with her correct choice and never has to worry about money again due to her patent. But what about the kids? She wants kids and to grow old and die. That's an intricate part of Sookie. Also, blondie would never put her first in his life. That was also always evident. I think you'd need a rewrite of the last half of the books to make it a different ending. What I'm saying is that she created a character and world where Sookie was never going to be with a vamp. Which, of course, is why people are pissed! Yikes! Okay, I'm really curious now. I haven't read the series yet myself, but I gave up on the show a few years ago (the first few seasons were really great, I thought). It's sad when a beloved series ends so terribly. I've only missed last season but I own every other one. I actually really like the show and the actors. I just had to comment...I actually gave up after book 5 or 6. I thought the storytelling really went downhill, after it started out with such a bang. I'm sure it's difficult to sustain a series for so long, but when you decide to end a series, I think authors should do their best to make it memorable. I can't say anymore since I haven't read the last book, but it sounds as if you won't be the only one disappointed! Some Authors can sustain a series. C.H. obviously could not. I think the biggest problem was C.H. for whatever reason tried to change her series to fit what was popular at the time. Sookie was given what I call the Kristen Stewart effect. Sure it might've pleased some readers but it was completely jarring happening 3/4 though the series. Also, she didn't want to write the series 3/4 of the way through, but they talked her into it because of True Blood. They also made her not kill Bill.(hehehe). I don't think she was as emotionally invested as her readership toward the end.